For me one of the most exciting things about cooking is finding a recipe or a technique that I haven’t encountered before. Who would have thought there’s an Italian veal recipe out there that is executed so differently from the usual scaloppine style dishes. The title would have you believe that the veal is accompanied by some sort of meat ragu but the reference to Bolognese is not about the world-famous sauce but the capital city of Emilia Romagna where this dish hails from. The veal in this recipe is lightly coated in flour and egg (no breadcrumbs) before being quickly flash fried. 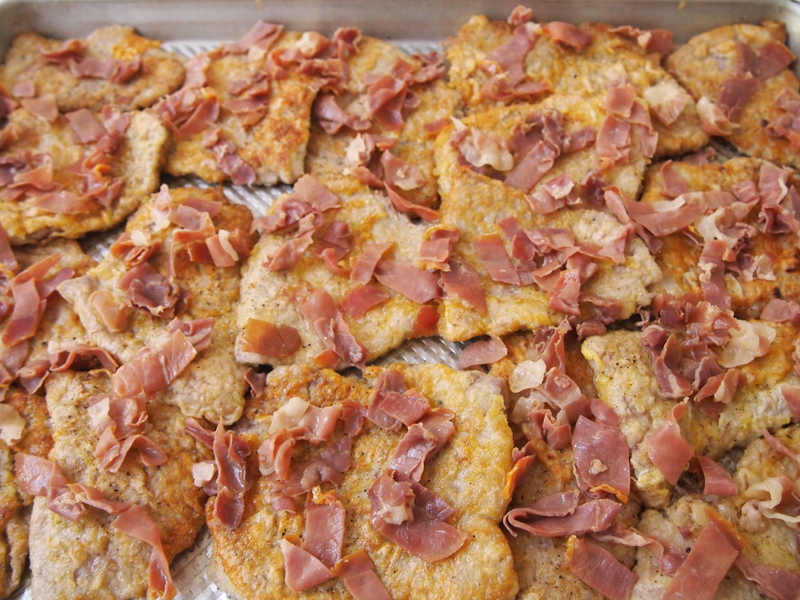 The veal slices are then laid out in a shallow baking tray and topped with a few spoonfuls of a rich prosciutto and Marsala based sauce. 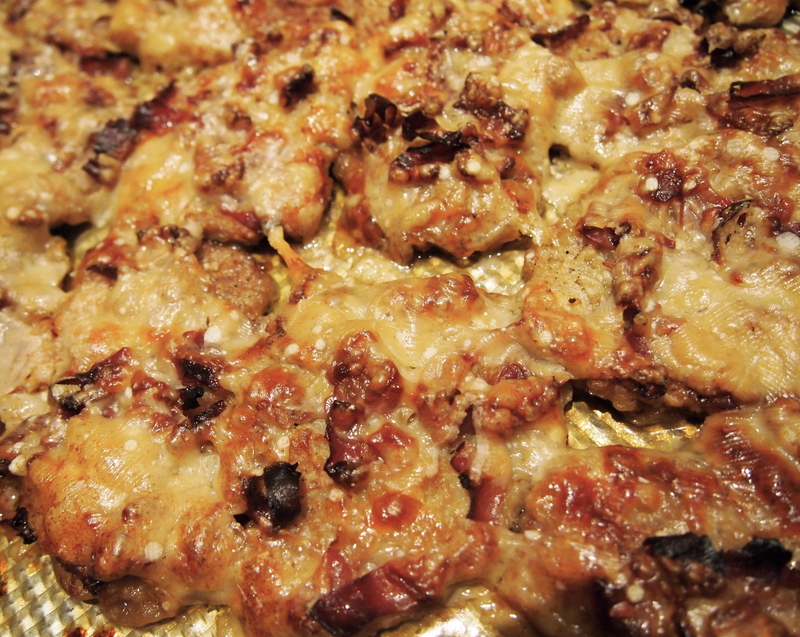 Now this is where it gets interesting – the whole tray is generously covered with thin shavings of parmesan, which gratinates over the top while it bakes in the oven, creating a lovely crispy coating on the veal. It’s vital for the cheese to be shaved and not grated as it won’t melt in the same manner and you won’t achieve the same crispy finish. 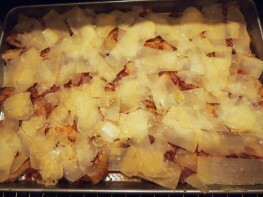 As you can imagine the final result of tender veal and crispy cheese is delicious. 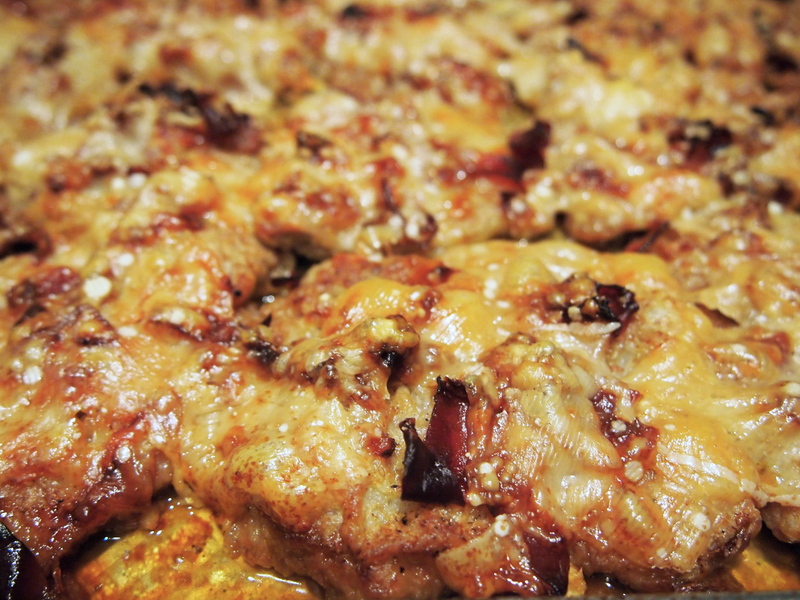 This is a great recipe for feeding a large crowd as you can fit quite a few pieces of veal on a large baking tray and of course make more than one tray if you need to. All the elements can also be prepared in advanced then quickly assembled and baked just before serving which makes it ideal for entertaining. Heat the oven to 200C and arrange a rack in the middle. 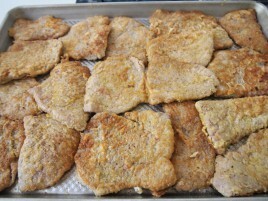 Spread the flour on a plate and dredge each piece of veal in the flour, coating both sides. Shake off the excess and set aside. Beat the eggs with a pinch of salt in a wide shallow bowl. Place 2 tablespoons of olive oil and 3 tablespoons of butter into a large skillet or fry pan (I like to use non-stick), and set over medium-high heat. When the butter begins to bubble, quickly dip the veal pieces, one by one, in the eggs, let the excess drip off, then lay them in the skillet. Fit in as many scallops as you can in one layer. Brown the scallops on one side for about a minute, then flip and brown the second side for a minute, then transfer them to a plate. Repeat with remaining veal pieces, adding a little more of the olive oil for each batch. When all the scaloppine are browned, arrange them in a baking pan – a shallow baking sheet is perfect, overlapping them if you need to so they fill the dish in an even layer. To make the Marsala sauce: Wipe out the skillet, melt the remaining 2 tablespoons butter in it, and set over medium heat. 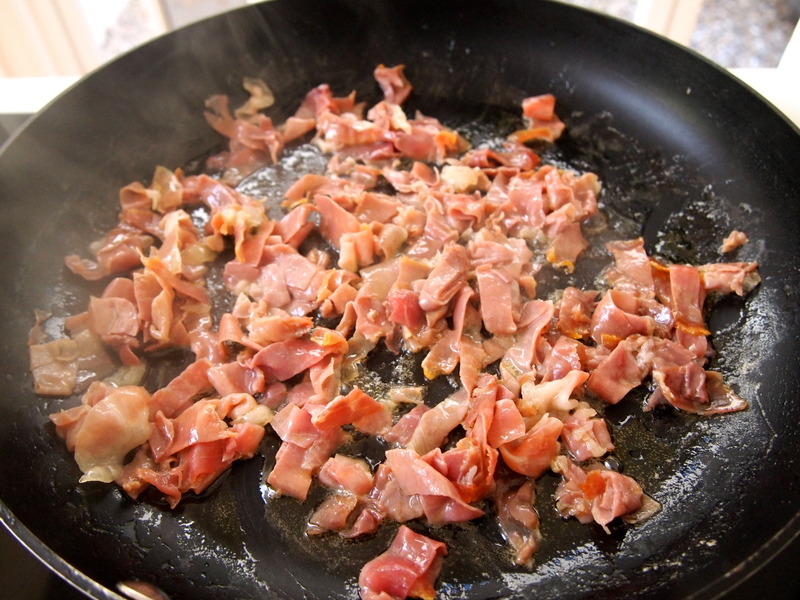 Scatter in the prosciutto strips, and cook, stirring, for a couple of minutes or longer, until crisped on the edges. Pour in the Marsala and white wine at the same time, raise the heat, and bring to a rapid boil. Cook until the wines are reduced by half, then pour in the stock, heat to the boil, and cook for a couple of minutes more, stirring, until the sauce has amalgamated and thickened slightly. 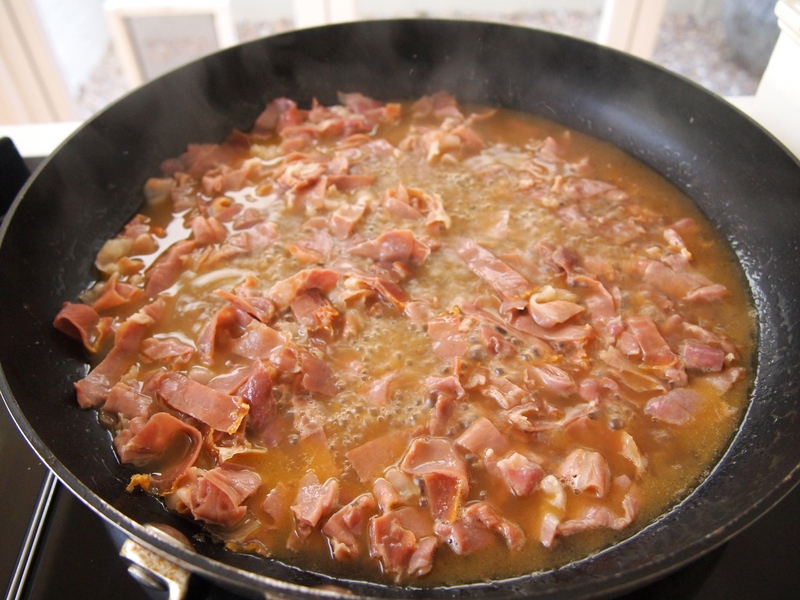 Remove the pan from the heat, scoop out the prosciutto strips, and scatter them over the scaloppini in the baking dish, then pour the sauce all over the meat, moistening the scaloppine evenly. 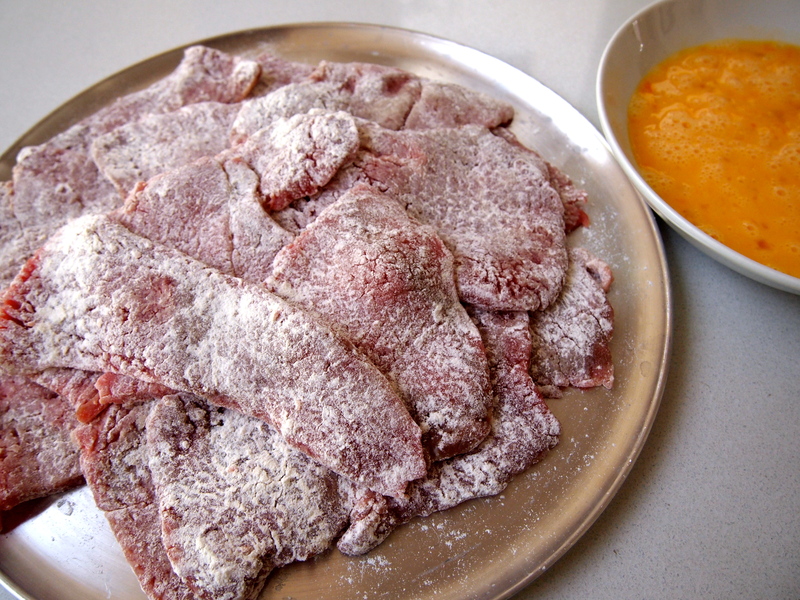 To make the gratinato: shave the chunk of Parmesan with a vegetable peeler – don’t grate the parmesan (see note above), dropping thin wide flakes of cheese over the scaloppine, making sure that all the veal is evenly covered. Set the baking dish in the oven, and bake for 20 minutes or so, until the gratinato is nicely browned and very crisp (rotate the dish in the oven to ensure even colouring). Remove the dish from the oven and, with a sharp knife or a spatula, cut around the scaloppine and lift them out, one or two at a time, with the topping intact, onto a platter or dinner plates. Drizzle the pan sauce around the scaloppine – not on top-and serve immediately.